Currently, more and more hardware has supported or is going to support 4K, 5K, 6K and even 8K video playback with higher resolution displays or monitors. The fact is, Windows 10 has natively supported 4K MP4 already. But it announces that Microsoft brings 8K support to Windows 10. However, as a rising media type, many people have no idea on how to play 4K/8K MP4 media files. In this article, we will offer you a simple way to enjoy 4K/8K MP4 files on Windows 10/8/7. Before playing the videos, there are some issues you may need to figure out, such as basic knowledge about 4K/8K. UHD 4K (3840 x 2160) refers to the horizontal resolution on the order of 4000 pixels while FUHD 8K (7680 x 4320) 8000 pixels. Resolution: 4K has 3840X2160 pixels mainly for Ultra HD television, or 4096X2160 pixels for digital cinema. 4K Ultra HD is exactly four times of the resolution of Full HD. 8K is a resolution of 7680 x 4320 pixels. 8K Ultra HD is sixteen times the resolution of Full HD, and four times of 4K Ultra HD. Total pixels: 4K Ultra HD has 8 million pixels, while 8K has 33 million pixels. Frame rate: 4K Ultra HD has a frame rate of 50 fps or 60 fps, while 8K Ultra HD has 120 fps. Standard viewing distance: viewing distance of 4K Ultra HD is 3X screen height, while that of 4K Ultra HD is 0.75. Standard viewing angle: viewing angle of 4K Ultra HD is 60, but viewing angle of 8K Ultra HD is 100. Audio channels: audio channel for 4K Ultra HD is 5.1, but the audio channel for 8K Ultra HD is 22.2. 4K and 8K Ultra HD, the two Ultra HD formats, can provide super vivid image and deliver perfect visual sense. But the issue is that users need to get a professional player so that they can experience the superb quality of the 4K/8K videos. To play 4K/8K MP4 video, you could make use of 8K Video Player software. Currently, there are very few 8K video player software apps available online. Brorsoft 8K Video Player (Mac version) has been considered as the best 8K video player so far. It not only can support 4K/8K MP4, AVI, MOV, WMV, FLV, MTS, MXF, MKV, H.265 common video formats, but also can impressively afford DVD/BD/ISO files. In addtion, it meets all expectations you have- stunning crystal-clear pictures, delicate dolby digital sound, or "ONE-KEY" to create GIF for sharing and more. Now, download the software and let's start playing 4K/8K MP4 videos on Windows 10/8/7. Step One: Free download and run the best 8K video player on your PC. Step Two: Click "Open File", "Open Bluray" or "Open DVD" to load media files for playback. 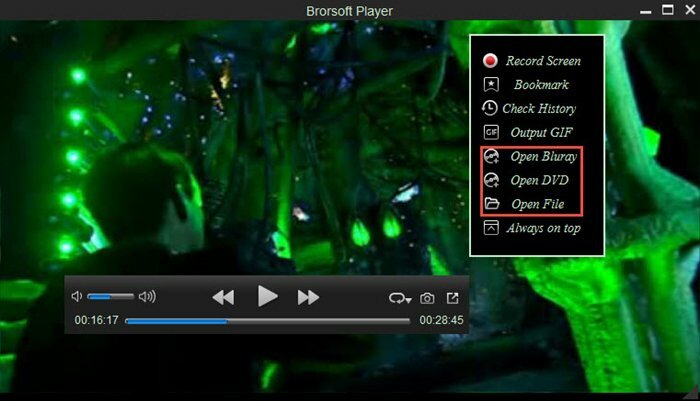 If you wanna play 4K/8K MP4 files on Windows 10/8/7, you can click "Open File" and locate the 4K/8K MP4 videos to play directly or right click the 4K/8K MP4 file and choose "Brorsoft Video Player" to play the videos. Now, you can enjoy the videos freely. 3. For windows users, you can have a try to install the K-Lite Codec Pack or Media Player Codec Pack to make Windows Media Player or Windows Media Player Classic to afford 4K MP4 videos.